PHOENIX — The U.S. 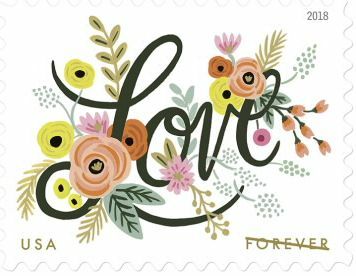 Postal Service today celebrates love of all kinds with the dedication of the Love Flourishes Forever stamp during a first-day-of-issue ceremony at the CREATIVATION conference held at the Phoenix Convention Center. Love Flourishes is the latest stamp in the popular Love series, which began 45 years ago. The stamp art features a fanciful garden of colorful flowers surrounding the word “Love” written in cursive script. Hand-painted by artist Anna Bond, the flower garden includes stylized roses, peonies and dahlias in pink, coral and yellow, with pale blue-green berries and fold fronds and leaves. Art director Greg Breeding designed the stamp with Bond’s original art. Share the news of the stamp using the hashtag #LoveStamp. Customers may purchase the Love Flourishes Forever stamp at The Postal Store at usps.com/shop, by calling 800-STAMP24 (800-782-6724) and at Post Offices nationwide. A variety of stamps and collectibles also are available at ebay.com/stamps. After applying the first-day-of-issue postmark, the Postal Service will return the envelopes through the mail. There is no charge for postmarks up to a quantity of 50. For more than 50, customers are charged 5 cents each. All orders must be postmarked by March 18, 2018. 564706, Press Sheet with Die-cut, $78.40. 564710, Digital Color Postmark Keepsake, $11.95. 564721, Digital Color Postmark, $1.64. 564724, Framed Art Gold Frame, $39.95.